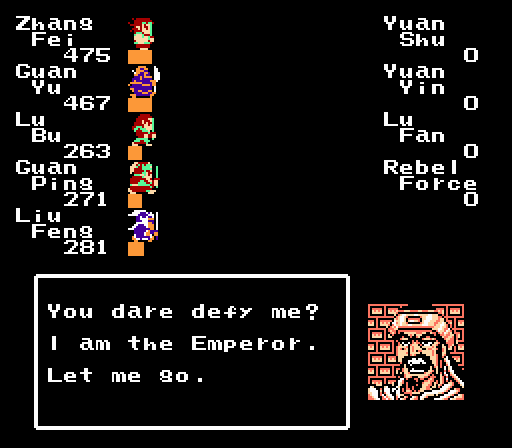 Destiny of an Emperor is a fairly obscure NES RPG by Capcom that never received much in the way of accolades, but is one I always thought should be in any serious old-school RPG collection! 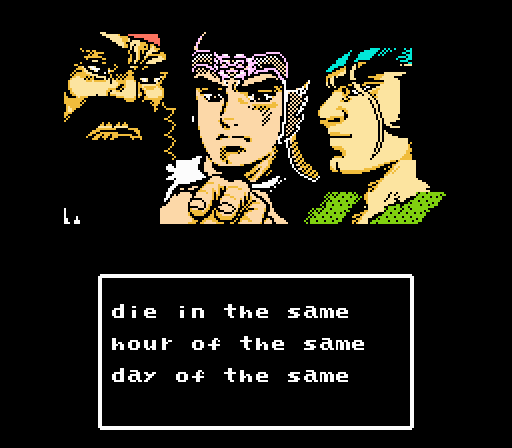 The story is based on the ancient Chinese epic “The Romance of the Three Kingdoms” (with quite a bit of liberty taken, I might add), which follows Liu Bei, Zhang Fei, and Guan Yu, and tells of the unification of the Han Dynasty. 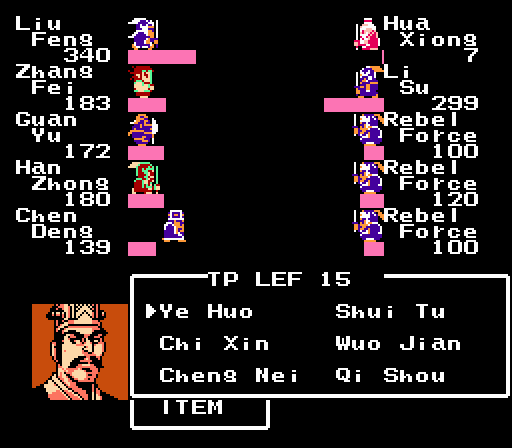 Many characters should be familiar to anyone who has played the Koei “Romance of the Three Kingdoms” games or the “Dynasty Warrior” games. 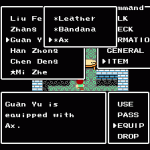 Unlike those games however, this is a turn-based RPG similar in gameplay to the Final Fantasy / Dragon Warrior series, but has some fairly unique elements I’ve never seen anywhere else. Your party is comprised of “characters” that are actually Generals that command large armies. You can have 5 Generals in your front line, and 2 more Generals as support/backup. 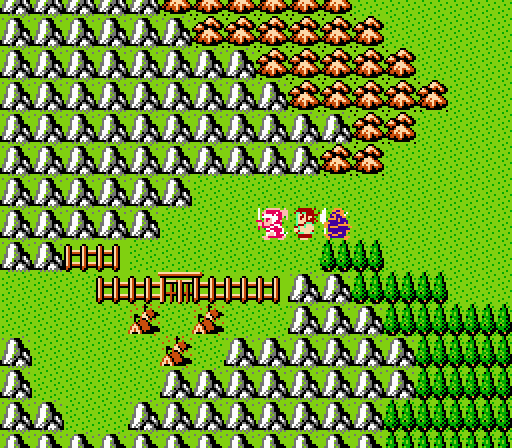 Each General is actually played much like a normal RPG character however, and the “armies” they command are really just treated as hit points. 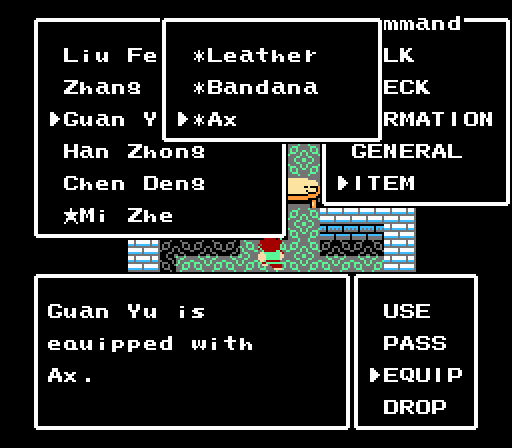 You can buy weapons and armor for your armies, but they are equipped like normal RPG equipment, it is just assumed that the General’s entire army is now equipped with that kind of gear. It takes a little suspension of disbelief, but once you get past that and the occasional grinding, it is a thoroughly enjoyable, and at times challenging game. Just don’t forget to talk to everyone (as usual) and definitely bring along plenty of rations!! The “magic” system in this game is quite unique as well. 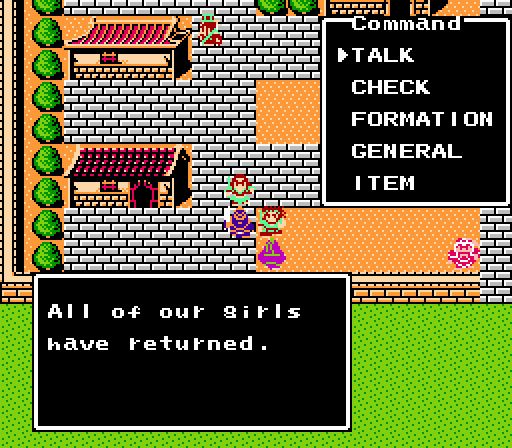 I put magic in quotes because it is actually referred to as “Tactics” and requires a designated Tactician. 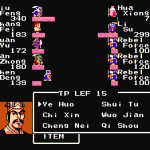 This is typically one of the 2 support characters (or the last General in the battle line-up if you only have 5 or fewer Generals in your traveling team), and has to be selected by the player. 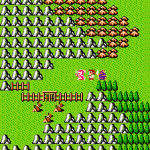 Once a character is designated as the Tactician, any Tactics that they have learned can be used by any of your fighting Generals, but you only have a limited number of Tactics Points (TP), which is determined by your army’s level. Different Generals make better Tacticians than others, having better and/or different Tactics and higher Intellect. Tactics can have a variety of effects, from causing Fire or Flood damage, to healing , to increasing combat strength or durability . Like I said, “magic”! 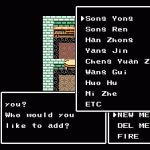 The names are all in Chinese though, so you’re gonna need to bust out the instruction manual or look up a walkthrough to understand which Tactics do what, but there aren’t too many, so it’s not too bad. Lian Huo (Year of Fire) – Weak Fire attack, one enemy. Ye Huo (Wildfire) – Slightly stronger Fire attack, one enemy. Yan Re (Scorching Heat) – Medium Fire attack, all enemies. Da Re (Great Heat) – Strong Fire attack, one enemy. Huo Shen (God of Fire) – Massive Fire attack, all enemies. Shui Tu (Water Plan) – Weak Water attack, one enemy. Shui Xing (Water Model) – Slightly stronger Water attack, one enemy. Shui Lei (Water Category (?)) – Medium Water attack, one enemy. Hong Shui (Flood or Red Water) – Strong Water attack, all enemies. Shui Long (Water Dragon) – Devastating Water attack, all enemies. Chi Xin (Novice Sustainment) – Weak healing, one ally. Tong Xian (Expert Thread) – Better healing, one ally. Yin Xian (Silver Thread) – Good healing, all allies. Wan Fu (Thousand Blessings) – Complete healing, one ally. Jin Xian (Golden Thread) – Very strong healing, all allies. Ji Rou (Strong Flesh) – Halves the damage received from all physical attacks. Wuo Jian* (Partial Fire) – Halves the damage received from Fire Tactics. * – I think Wuo Jian was suppose to be Huo Jian. Wuo makes absolutely no sense here. Shui Jian (Partial Water) – Halves the damage received from Water Tactics. Ce Mian (Avoid Tactics) – Prevents all enemy Tactics from working. Ji Mian (Avoid Strength) – Prevents enemy’s physical attacks from doing damage. 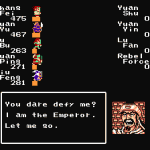 Cheng Nei (Inside Castle) – Forts add bonuses to the defenders, this nullifies that. Yi Xin (Newly Alone) – Causes enemy to doubt allies, does nothing for a while. Li Jian (Divided Plum (?)) – Causes enemy to start attacking his allies for a while. Qi Shou (Timely Hand) – Increases target officer’s Agility, letting him act sooner. Jie Ce (Expire Tactics) – Disables the effects of any Tactics the enemy has used. An Sha (Assassinate) – Instantly kills target by cutting off the officer’s head. Bei Ji (Strength of the North) – Doubles power of both attacks and Fire/Water Tactics. Fu Bing (Fortunate Defect (?)) – Get in an extra attack. Tui Lu (Route of Retreat) – Retreat from battle. 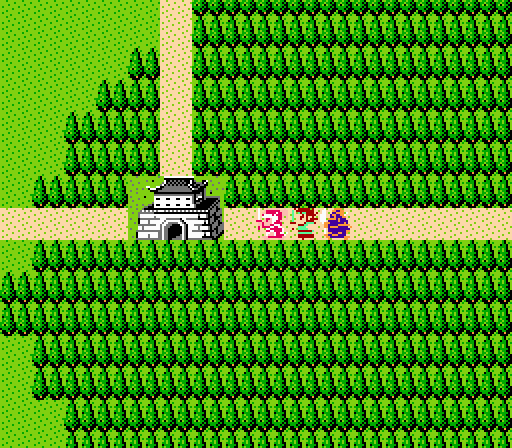 Gui Huan (Return) – Retreat from battle and go to Lui Bei’s current castle. As the game progresses, you find yourself increasingly caught up in the middle of a growing political and military struggle to control different areas of ancient China (Shu, Wu, and Wei). 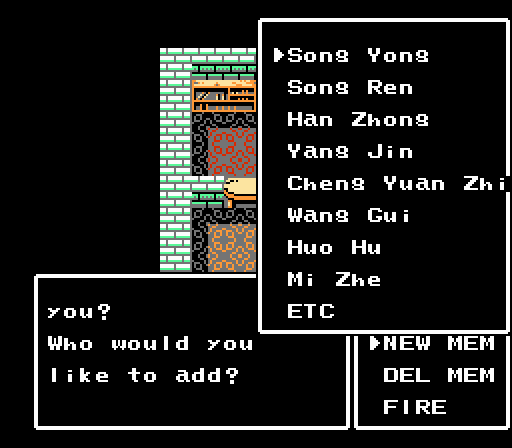 Eventually, your role becomes saving it all from the would-be “Dragon” Emperor and unite all of China under the Han Dynasty (ie. yourself). Pretty ambitious if you ask me! There is plenty of intrigue along the way: dictators overthrown, alliances made and broken, betrayal… and Lu Bu. Good grief! Lu Bu must be Chinese for “drama”!! There is a sequel to this game that was never released outside of Japan (Destiny of an Emperor 2). It re-tells the same set of events, but it is mixed up quite a bit with newer features, brand new maps, and tries to tell the story in a more dramatic way, with more specific character interactions. 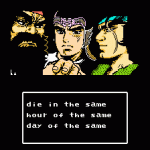 You could probably compare DoaE 1 and 2 to Dragon Warrior 3 and 4, as far as the story-telling quality is concerned. To play through the sequal though, you’ll need to find a translated version. 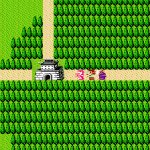 That is unless you know Japanese and can find the original cart, of course! William was first introduced to video games with his brother's Atari 2600, but was seduced by them when his cousin got a Nintendo for Christmas. After pestering his parents for a year, he finally got one of his own. 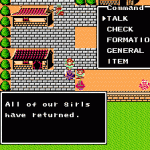 Shortly afterward, he subscribed to Nintendo Power to get a free copy of Dragon Warrior, and has been obsessed with RPGs ever since. Nice article as always Will.